*Kanye voice* what she order, fish filet? So it has come to this: ya girl has been a combination of too busy, overcommitted, otherwise engaged, and pretty much any synonym for busy that you can think of, to even think of cooking. 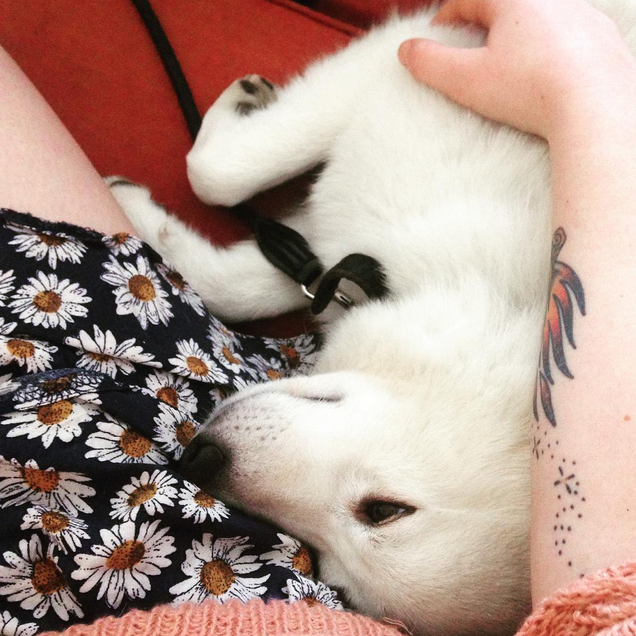 I haven’t blogged for over a week, which, considering my insistence on overachieving, means that I may as well just delete the whole blog and throw my laptop in a river because I have clearly failed and everything is pointless. 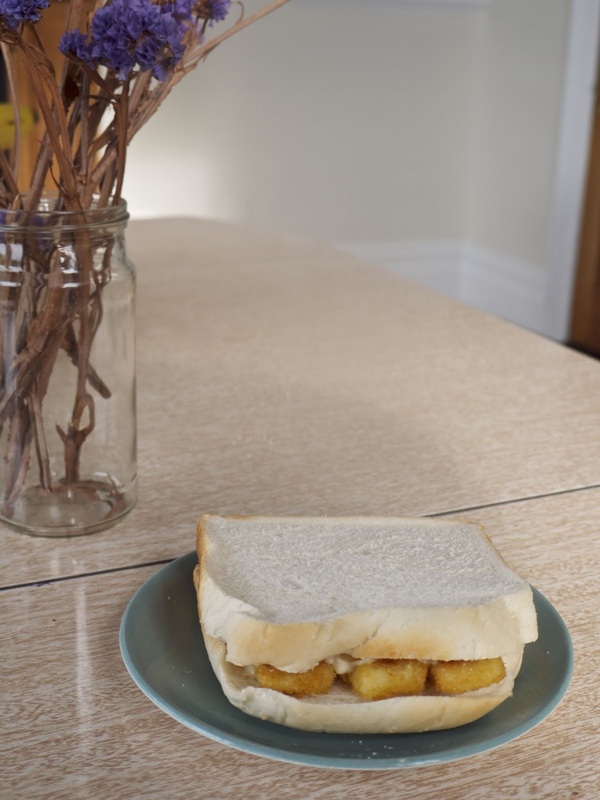 However, instead of that mildly hyperbolic behaviour, I’ve decided to just accept the past week as a write-off, and write on the few things I did make myself this week, even though those things are: fish finger butties and marmite-and-chip sandwiches. I’m not trying to pretend like I invented either of these concepts, or that you need a recipe for them, or that they’re high art as far as food goes, but – both were really, really delicious and made me happy, and even if they’re embarrassingly easy and simple, to be honest that’s good enough for me to blog about. Especially since I have zero other options, but still. Also stupid as it may seem for me to be telling you how to put prepackaged stuff in bread; I feel like if nothing else this blog post can serve as a reminder that these concepts exist. 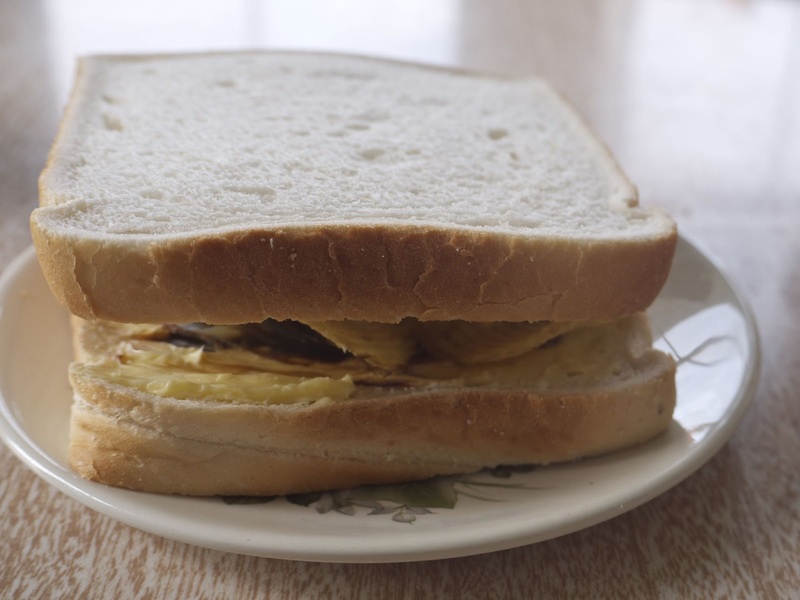 I mean, it had been forever since I’d had a marmite-and-chip sandwich and having revived that combination for myself I am now wanting them at least daily. Whether you prefer to use mayo or butter – and I actually prefer mayo here – the bread has to be the softest, whitest, and thickest you can find. The fewer minerals and vitamins and general health-giving content the better. Similarly, if you can find those fish fingers that are crumbed and have maybe 4% actual fish content in the ingredients, you’re on to a winner. With the marmite-and-chip sandwiches, the chips in question are the crisps that come in a packet, not fries (I don’t know why we have such confusing language around potato products, it’s very troubling!) and obviously you can use whatever sodium-delivery-spread you like – Vegemite, Promite, English Marmite. I grew up on Marmite and adore it, whereas Vegemite to me tastes like salty dirt and misery. Many of you probably feel the reverse. Whatever, as long as the chips are crinkle cut and the plain salted flavour, you’re all good. I ate marmite sandwiches roughly a billion times when I was a kid, but a marmite and chip sandwich – and I have no idea who first came up with the idea – was such an exciting upgrade. And there’s nothing like casually eating the food that was thrilling to you as a kid, when you’re an adult who can do what they want when they want. So, the reason either of these sandwiches are worth your time is the magical, transcendently good textural contrast between soft, soft white bread and crunchy filling. It’s as simple as that. Bursts of crispness, salty savouriness, and comfortingly pillowy blandness. Bake or fry the fish fingers till crisp and golden. My cunning trick is to put them in the sandwich press, but do whatever is most convenient for you. 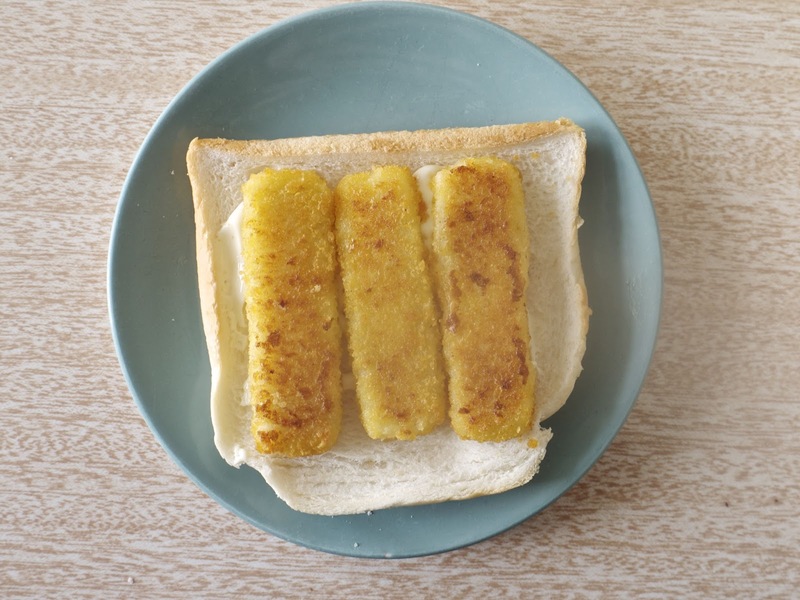 Generously spread mayo on both pieces of bread, lay the fish fingers across one slice and top with the other slice, eat the remaining fish finger so you don’t fade away between now and eating your sandwich, and then eat your sandwich. Spread both pieces of bread thickly with butter and then thinly with marmite. Pile up potato chips evenly on top of one slice, then gently top with the other slice. Eat. It’s kind of hard to photograph these sandwiches in a way that makes them look majorly alluring, I feel like sticking one next to a vase of flowers was not my best work, I guess I’m also pointing this out so that you know that I know. Like I said, I haven’t cooked a thing this week and so this is what I’m working with. But honestly, I’m so convinced of the excellence of both these combinations that I’m not even bashful about having blogged about them now, because if you didn’t know about them, you’ve been missing out on a world of deliciousness. I’m not saying I’m a hero, I’m just saying…nope that actually is what I’m saying. So just what have I been doing with myself if not devoting myself to blogging? Working; partying; helping a friend choreograph a tap dance routine for a drag competition; going on cute outings with people from work; loitering with birthday pals; seeing a friend’s band perform; recovering from watching Pretty Little Liars; taking up lots of time being amazed at how time has gone so fast and it’s July already; dancing wildly; working; berating myself for having achieved nothing this month; that sort of thing. Ya girl is determined to get cooking again though, what with it being my favourite pastime and incredibly dear to my heart and all. title from: The White Stripes, Hardest Button To Button. I love these guys so much, that is all. Carly Rae Jepsen, Emotion. TUNE. Pop music that is really upbeat but sounds kinda sad is my kryptonite. Chelsea Jade, Lowbrow. This honey just keeps making songs that are amazing. It’s amazing. Nicki Minaj, Anaconda. Every time I listen to this or watch the video it just gets more and more spectacular and excellent, tbh. 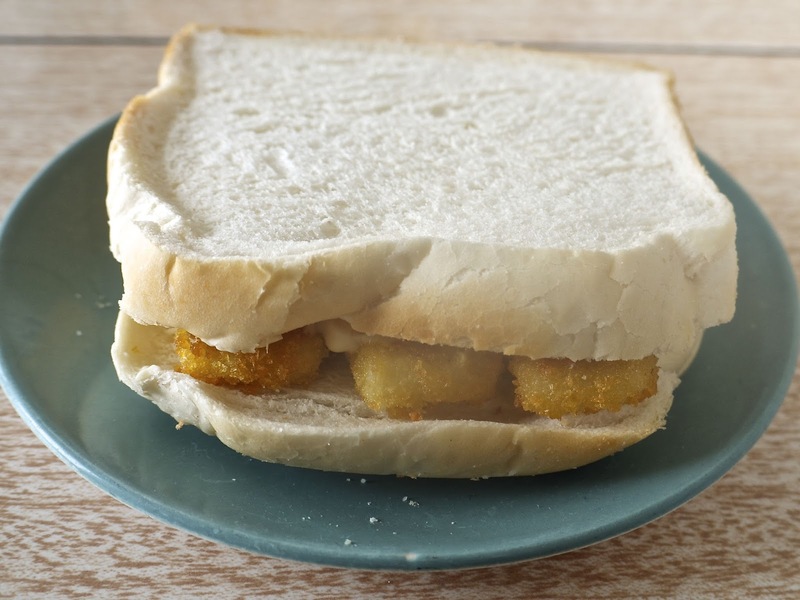 Chip butties I know, but not fish finger butties. Sounds like a fantastic innovation! Thank you! My husband was working with one of the regional police forces a few years ago. He got into an argument about fish finger sandwiches (instigated by me, I have to say) because one of the people he worked with used brown bread and salad on his. Which is clearly wrong. They ended up using the murder board to tally bread and sauce preferences of everyone who came into the office for a week. White bread, tartare sauce. It's the law.